Do we need another text editor? 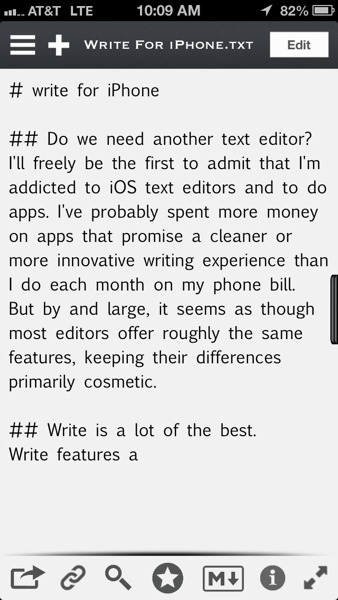 I’ll freely be the first to admit that I’m addicted to iOS text editors and to do apps. 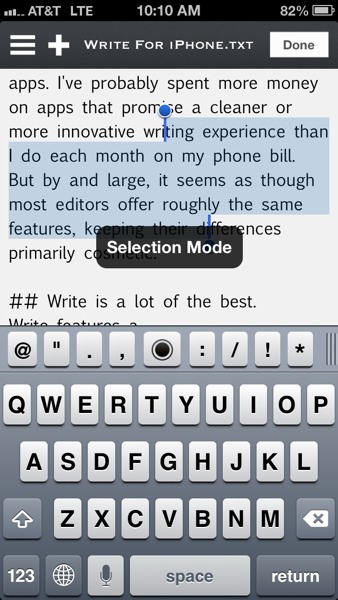 I’ve probably spent more money on apps that promise a better writing environment than I do on my phone bill. It seems like every week there’s a new app on the App Store promising new features, a clean interface, and an immersive writing experience. This influx of writing apps on iOS has brought about some of the platforms best innovations, like the formatting bar in Byword and ia Writer. Apps like Drafts give you a way to quickly capture ideas and then send them off to another app for finishing. 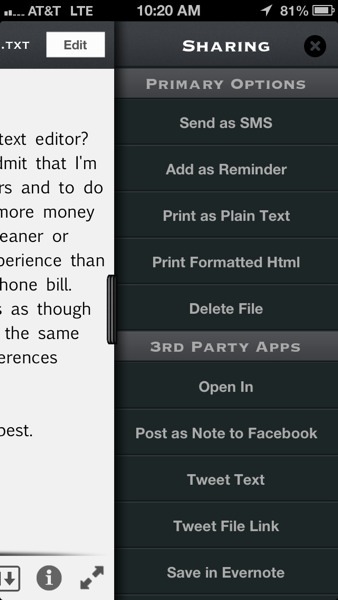 All of these features are great and bring a new level of usefulness to iOS; but do we really need this many text editors? Write brings a lot to the table. Write for iPhone takes many of the most common and popular features and approaches found in these iOS text editors and consolidates them into one great, easy to use and surprisingly inventive app. As soon as I opened Write, I was greeted by a quick tour of the app’s interface and features. This is pretty common for iOS apps, but I still appreciate it when I see it. 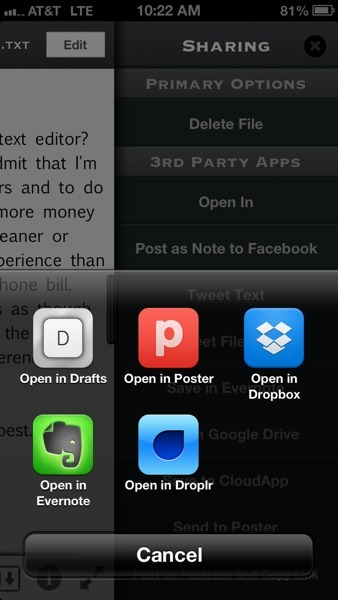 After the tour, Write gave me a blank document and almost instantly switched over to the DropBox app on my iPhone. Because Write saves all of your documents as .txt files in DropBox, it requires you to authenticate your DropBox account before you start writing. I realize that not everyone uses DropBox or wants a text editor saving to their account automatically, but I’ve found this to be a great time-saver. I was able to start this post in Write and then easily pick it up in Byword on my Mac, thanks to DropBox. I have to give lots of brownie points to Write for using the URL callback scheme for DropBox authentication. Instead of asking for my DropBox email and password, it just switched over to the DropBox app on my phone, and then switched back once I told DropBox that Write had my permission to use my account. Again, this may not be a dealbreaker, but it is a great convenience and I hope that more and more developers will start to use this as time goes by. On the surface, writing in Write (which is awkward to type) isn’t that different from something like ia Writer or Byword. But there are a few nice details that made my experience with Writer a great one. 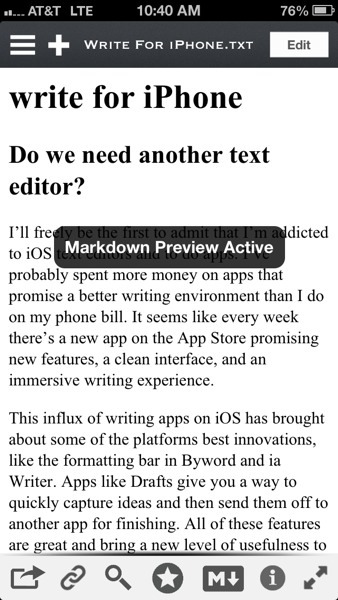 First off, Write’s toolbar features a button for instantly previewing your Markdown. I do most of my writing using Markdown, so being able to toggle a live preview within the app made my time using Write that much better. I think anyone who does a lot of Markdown composing will love this feature. The toolbar in Write gives you quick access to common punctuation and symbols on it’s first “layer”, while a swipe to the left brings up a formatting bar where you can quickly apply Markdown styles and headers, insert links, or even add images into your document. The ability to add images is an especially nice touch. But the real piece de resistance for me was Write’s Trackball mode. In the center of the punctuation bar in Write lay the toolbar, the feature that made me stop, stare and then rush off to show a friend. Holding down on the trackball lets you move your cursor by dragging your finger around your screen. Instead of using the iOS “magnifyer” to line up the cursor, Write’s trackball gives you the ability to quickly and easily reposition your cursor anywhere in your document. You can also tap once on the trackball to switch to selection mode, letting you hold and drag your finger to select text in your document. These two functions alone made Write more than worth the 99 cents, and saved me tons of time writing this post. Swiping left while in a document opens up Write’s share menu, where you can perform some pretty typical functions like copying the full text or emailing the file. Write also comes replete with a pretty healthy list of 3rd-party app actions, letting you easily send your work to Evernote or post a tweet with a link to your file in DropBox. Write also supports the default “Open In,” and I could even send my text to Drafts if I needed to use more extensive actions. 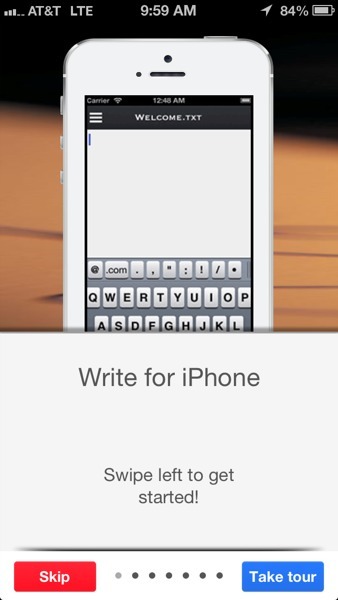 I think Write has more than earned a place on my home screen. The interface is simple, but hides a surprisingly robust list of features and commands. The trackball is one of the best features I’ve used in any text editor, and while the list of actions and sharing options may not be as robust as an app like Drafts, Write’s options should more than satisfy the majority of users. When you top it off with automatic DropBox saving and live Markdown previews, you’ve got a strong and unique contender in what has become a heavily saturated slice of the App Store market. 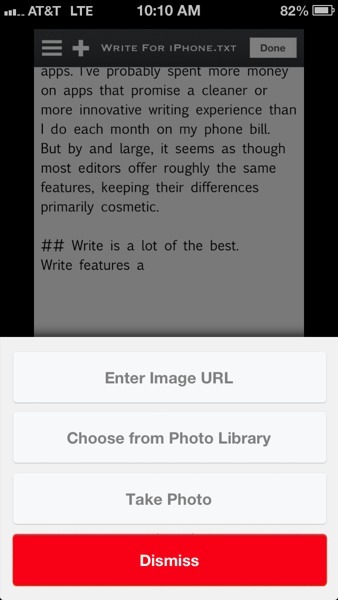 Write is available for US $0.99 in the App Store, and is worth every penny. Not as many sharing options as other apps in its category. Not all users have or want to use DropBox for storage.